Obviously (and thanks to the whisky gods) there is no accounting for taste - so beware all you whisky newbies and value-seekers: Your taste buds (like that of the majority of all drinkers) are for sure different to the taste buds of the so-called experts so do not follow them like a lemming does but rather build your own taste - what provides significantly more whisky-fun, too! Young, a little immature with a clear "designed" spike towards herbal aromas (using the re-charring effects). Hey, what is great about this unless you are a herbalist? The mouthfeel is rather drying-astringent and it seems there are some virgin oak casks included as well (despite they did not state this - but they are not obliged to do so) or they de-charred the casks that completely that only virgin oak was left. The finish is long and very spicy (peppery) but again neither complex nor balanced. Sorry, I am not a herbalist. Well ... well, but that's not the big deal. The alcohol is very well integrated, one notices from the nearly 60% not so much. 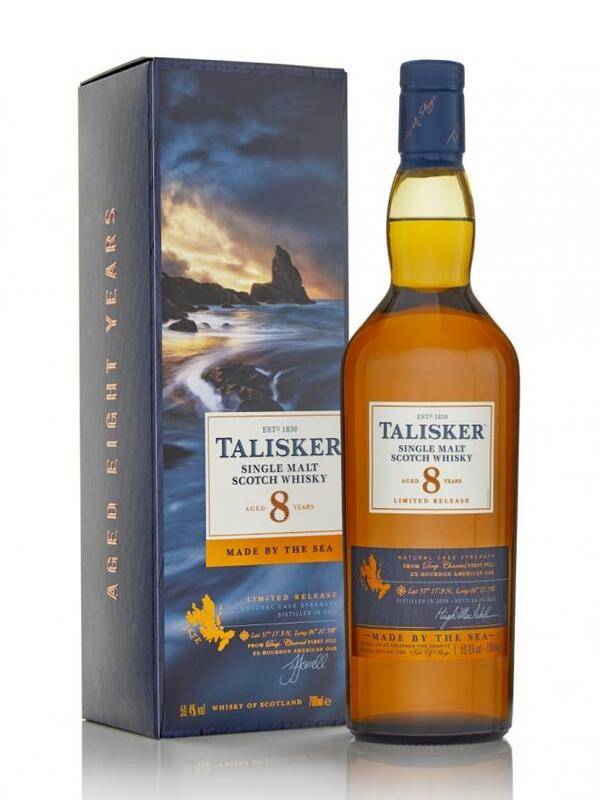 And it is also "interesting" to have a potentially powerful 8yo OA Talisker in the glass. But a bit more variety of flavors could have been expected even with a 8yo. Then the quite ambitious price comes along ... But well, you do not have to talk about him worse than he is. Quite a decent whisky, but maybe they expected a bit more from Talisker. Note: Once opened, it benefits from oxygen exchange. It's worth having a long breath. It takes a while for it to release aromas. A little life in the glass does him good, I still want to avoid water. After a while, the fruits come: melon, mandarin, green apple. Add a pinch of pepper, so that the nose does not turn out too fruity. On the tongue with a good portion of espresso powder and pepper. Gives neat tinder in the mouth without burning. Even undiluted to tolerate very well, alcohol well integrated. When it comes to the variety of flavors, it also lingers a bit on the tongue. In addition to the espresso powder nougat and marzipan, honey, a few bright fruits (in the direction of pear). Medium to short, with pear compote, pepper, Werther's real and a good shot of honey. Talisker remains very popular. 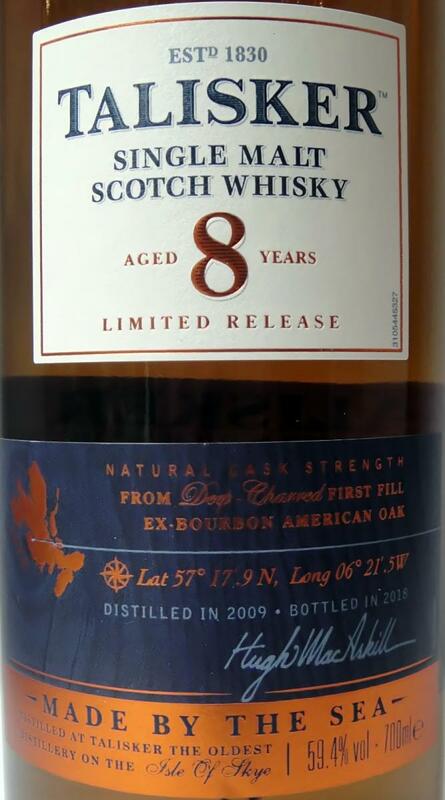 And while this one is fairly young with its 8 years on first fill bourbon hogsheads (and not cheap with a price tag of 85 EUR), I’m sure it will fly off the shelves. But rightfully so, for this is a textbook Talisker and that is always good news. The first thing that jumps out on the nose is the characteristic pepper on which Talisker seems to have a copyright. But the sea and some soft smoke are also represented. The difference with the classic Talisker? The fruit. I get some melon and mandarin next to some breakfast cereal. But oh, so good! And the fact that it is bottled a such a high ABV is a big plus. Powerful! Ka-boom! A very feisty kick to the teeth! The ABV surely lets itself be felt. Yet I do not feel inclined to add water. Very sweet – more than I am used to from Talisker. Must be the first fill casks. Some nuts, a lot of citrus, some cereal and loads of pepper. The finish, however, is very soft with a lot of sweetness and even some menthol at the death. Yup, these will sell like cupcakes, but righfully so. Very good Talisker. Do not hesitate. Only trust your own taste - it reminds me very much of a young Lagavulin. Very drinkable and enjoyable in my mind. I can enjoy this one the same way as I can enjoy the Talisker 1955 50yo (Cask 1312). Nose: You notice this part of the alcohol strength directly, the 59.4% creep up a nose, after a few minutes in the glass, the alcohol is a bit "verwabert" and more aromas rise in the nose, the first association is white pepper as well as a surprising medical note (almost in the direction of the old Laphroaigs) of the Talisker of the last few years, it is joined by some vanilla, which becomes stronger and stronger, all wrapped up in a pleasant smoke. Mouth: Strong onset, of course owed to the alcohol, which also stimulates the salivary flow here, slightly bitter (but not unpleasant) with a pepper sharpness, the Talisker the last few years but something goes slowly, a sweetness comes to the fore, paired with I find Talisker to have a lot of "peat", while giving himself a nice oily palate. Finish: Slightly sweeter, while remaining slightly bitter, the pepper sharpness remains here until the end, the smoke flavor is also still present, pleasant length of the finish (strong mid-length). With water: a little more pleasing, sweeter, but I quickly get too watery, because I prefer the cask strength or maybe a few drops. Anise, old honey crystals, a little brininess, caramel, apricot. No alcohol at all. Spicy, damp-smoke, very sharp brininess, some honey-fruit, but that disappears very quickly into bitterness. Medium, with a bitter after taste. Extremely smoky-maritime, young and absolutely atypical for the Skye-Malt! The smoke is accompanied by sweet and fruity aromas, along with BBQ, ham, marinated meat, pepper, sea salt and hints of black powder. The fruity yellow-green aromas tend to run in the background. Gentle start but immediately sharper, spicy and powerful. Chili, paprika, cayenne pepper and more and more salt. Ultra spicy, maritime and spicy. The black powder notes develop more and more. Fruity green, with lime, soft grapefruit and green apple; but without a chance to be in the foreground. Long - the alcoholic pungency goes away, the maritime salt remains and green notes, some wood, corrugated cardboard, slightly bitter herbs and olives characterize the finish. The taste is overcrowded with sharpness, alcohol and spice, so that unfortunately all other notes are somewhat covered. Nevertheless, he likes us very well! I tasted it twice, the first time I knew what was in the glass, the second time Blind. The second time he tastes even better ... I think that says a lot about this bottle. In the beginning, it has the character of a refill sherry barrel, a first fill bourbon, I do not think so right away. Wonderfully harmonious smoke, reminiscent of a camp fire, that already 2 days has extinguished. Firewood, removed comes a sweetness of ripe, dried red fruit. Brine, seawater is in the air. Abrasion of lemons and oranges. The island whisky is at its best. Strong start, youth and alcohol play together. The whole mouth is taken, smoky caramel spreads ... the Fasscharakter American Weiseiche. A richly toasted bourbon barrel. Laaaaang, warming, sweet and smoky. Not quite as high score, it lacks a bit of complexity. Nice nose, maritime on brine, peat a little grapefruit and lemon zest but for 59% this is quite restrained. Good mouthfeel, creamy, peppery, classic Talisker with a hint of smoke. Worth the money in my view.